Love wordsearch but looking for more of a challenge? 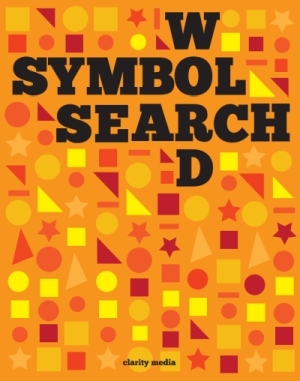 Symbol search is the perfect solution and great for putting your concentration and ability to spot patterns to the test. 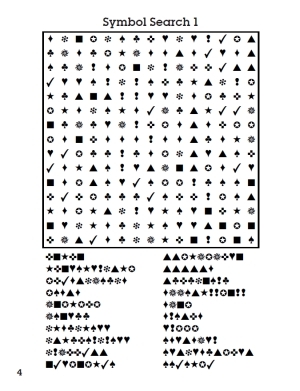 This collection of 100 full page symbol search puzzles are great if the rules of traditional wordsearch are that little bit too easy for you. The requirements of this puzzle will really challenge your eye for detail and use of memory in order to remember the pattern of twelve shapes. Sometimes our eyes find it easier to spot a repeating pattern so it may be useful to look for patterns of 2 or 3 shapes first. Another option is to remember the first 3 or 4 shapes and scan the grid for those, once found, can you find the remaining pattern or are your eyes just playing tricks on you?! Symbol search puzzles are a great alternative to the traditional wordsearch and are sure to provide hours of entertainment. Printed at one a page, the grids are plenty big enough and as always, are printed on very high quality paper. Solutions to all 100 puzzles are in the back of the book so if you get stuck along the way, take a look there! Please do let us know how you get on with this unique puzzle. Good luck and happy solving!